You can win £25k this weekend just for picking the four 1st goalscorers in 4 Premier League fixtures. And the best part – it’s FREE to enter. It really is that easy. Find below our Betway 4 To Score predictions for this week! In order to play, all you need is an account. You don’t need to bet or deposit to play, and all account holders get one prediction free each week. Sit back and watch the goals roll in. Join Betway via our special links or banners! Paddy Power Hotshot Jackpot Free Tips! Copy & Win! 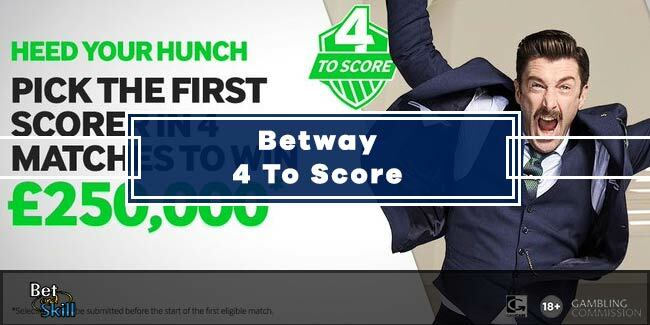 Betway 4 To Score Predictor Game - Win £25k Jackpot - Free To Play! "Betway 4 To Score Betting Tips & Predictions - Win £25k jackpot!"